This is a very large and sprawling 37mm. LONGINES Ultra-Chron in stainless steel and only 9mm. thin. The original LONGINES winding crown is installed. The quadrant dial is very attractive, pristine and all original, including the baton hands. Notice the trapezoid shaped date aperture, which adds much interest. The fine caliber 431 LONGINES automatic winding movement was just cleaned and is accurately keeping time. 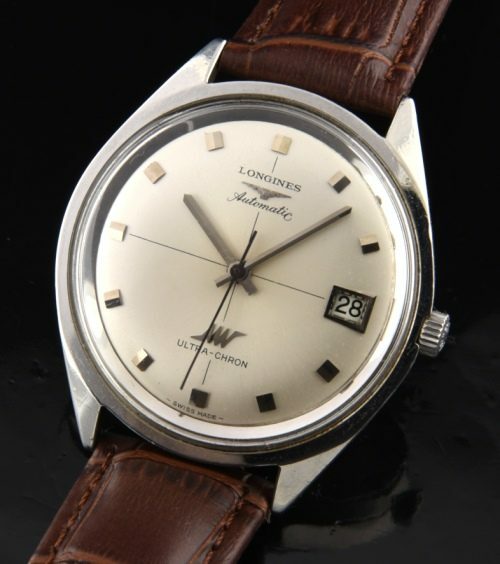 These oversize vintage LONGINES watches are truly undervalued and becoming hard to find.